Whereas, Member desires to retain Afaxys GPO Services as a group purchasing organization as of the Effective Date in accordance with the terms of this Agreement. Afaxys GPO Services shall furnish group purchasing organization services to Member, including, for example, assessing the needs of Members and their patients, identifying quality products, preparing requests for proposals, analyzing responsive bids and negotiating Supplier Contract terms on behalf of the Members (the “Program”). 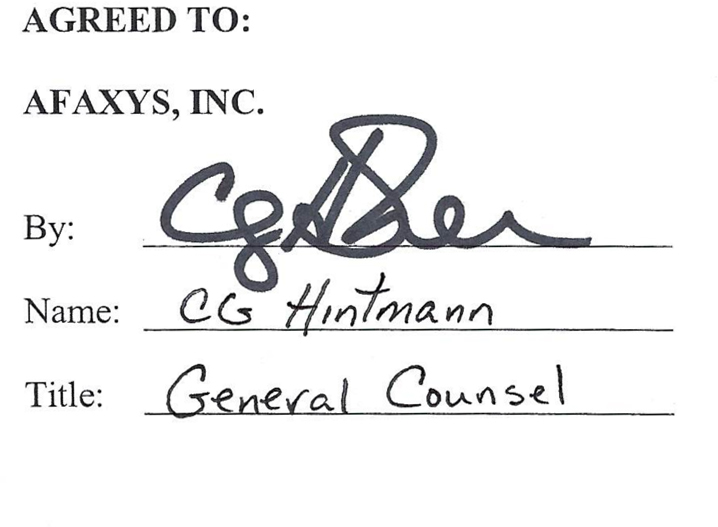 Subject to the terms and conditions of this Agreement, Member hereby engages Afaxys GPO Services as its group purchasing organization (“GPO”) to negotiate and enter into (i) purchase agreements with vendors, including manufacturers, distributors, or other third parties (“Suppliers”), and (ii) GPO participation agreements (collectively, such agreements are “Supplier Contracts”). For purposes of this Agreement, (i) the term “Supplier” shall also mean and include any supplier of a GPO with which Afaxys GPO Services has entered into a Supplier Contract in the form of a participation agreement on behalf of Member as authorized above, and (ii) the term “Supplier Contract” shall also mean and include a Supplier’s Supplier Contract with such other GPO. Afaxys GPO Services shall negotiate and enter into Supplier Contracts on behalf of Member, pursuant to which Member on a non-exclusive basis (i) may purchase products and services available under those Supplier Contracts for use by Member, and/or (ii) participate in other GPOs or arrangements under which Member may be able to gain access to services or purchase products and services from Suppliers with which Afaxys GPO Services does not have Supplier Contracts. Member hereby authorizes Afaxys GPO Services, as the authorized agent for Member and in its name, to: (i) negotiate the terms of and enter into Supplier Contracts, and to cancel, amend or modify any Supplier Contracts as it deems necessary, advisable or appropriate; (ii) receive from Suppliers, third party organizations including other GPOs, distributors, and e-commerce companies, data relating to purchases of products and services under Supplier Contracts by Member and (iii) share in any administrative and other fees arising from any purchases made by Member pursuant to any Supplier Contract. With the exception of a contractual relationship that Member may have had with a Supplier and disclosed to Afaxys GPO Services in writing prior to the Effective Date of this Agreement, Member shall not enter into direct contractual agreements or other relationships with Suppliers, other than a local supplement or other ancillary agreement to support a Supplier Contract in which Afaxys GPO Services has a Supplier Contract without the prior written approval of Afaxys GPO Services. (a)	Disclosure. Afaxys GPO Services and Afaxys Pharmaceuticals are business divisions of Afaxys, Inc. Afaxys GPO Services offers products in the Program that are marketed and distributed by Afaxys Pharmaceuticals. Member acknowledges that Afaxys GPO Services has advised Member that participation in the Program is in no way conditioned upon, or creates any commitment or requirement for Member to purchase any Afaxys Pharmaceuticals products, or in any way, restricts Member from purchasing products from a Supplier that may offer products which compete with those distributed by Afaxys Pharmaceuticals. (a) Confidentiality. Each Party shall hold all confidential and proprietary information, including but not limited to the terms of this Agreement and the proposed and actual Supplier Contract prices and terms and conditions, in confidence and in accordance with any applicable provision of the Supplier Contracts and shall not disclose such information to any person or entity without the prior written consent of the other Party; provided, however, that the foregoing shall not apply to information which (i) is generally available to the public or was already known at the time of the disclosure, as evidenced by a Party’s written records, (ii) becomes available on a non-confidential basis from a source other than the other Party which source was not itself bound by a confidentiality agreement, (iii) is required to be disclosed by Law, or any governmental or regulatory authority provided that the disclosing party provides reasonable prior written notice of such disclosure and uses all reasonable efforts to minimize the extent of such disclosure. Each Party shall use confidential and proprietary information solely for that Party’s performance of this Agreement, and upon the termination of this Agreement, or at the request of the other Party, will return or destroy all materials containing any portion of the confidential and proprietary information. Provided however, that, one (1) copy of the Confidential Information may be retained for the sole purpose of monitoring a Party’s ongoing obligations under this Agreement, and there shall be no obligation to destroy any Confidential Information retained in a Party’s electronic computer storage systems or backups or archival storage thereto. The non-disclosing Party shall be entitled to injunctive relief to prevent a breach or threatened breach of this Section, in addition to all other remedies that may be available. This Section shall survive termination or suspension of this Agreement. (b) Indemnification. To the extent permitted by Law, Each Party shall indemnify, defend and hold harmless the other Party, and its shareholders, directors, officers, agents, affiliates, employees, successors and assigns from and against any and all losses, claims, liabilities, shareholders, lawsuits, costs, damages, and expenses whatsoever, including reasonable attorneys’ fees and court costs, arising out of, incident to or in any manner occasioned by or attributable to: (a) the breach by the Party of any representation, warranty, covenant or obligation set forth in this Agreement; (b) any intentional or negligent act or omission by such Party, its employees, contractors or agents in the performance of this Agreement; or (c) any violation of any applicable Law. (c) Compliance with Law. During the term of this Agreement, each Party will comply with all applicable federal, state or local constitutional provisions, laws, rules, regulations, ordinances, orders, judgments, or decrees issued or promulgated by judicial, governmental or regulatory authority (collectively, “Law”) applicable to the conduct of each Party arising out of, or related to, this Agreement, including, but not limited to those Laws regarding (i) reimbursement under any state or federal governmental payment program, including but not limited to any state Medicaid program and the federal Medicare program; (ii) engaging in any activities which are prohibited under federal Medicare and Medicaid statutes, 42 U.S. C. §§ 1320a-7, 1320a-7(a) and 1320a-7b, or the regulations promulgated pursuant to such statutes or related state or local statutes or regulations (including but not limited to the federal Anti-Kickback Statute); and (iii) Section 340B of the Public Health Service Act (42 U.S.C. § 340B(a)(4)). For purposes of clarification, the term “Law” includes any State constitution provision, law, statute, regulation, reported judicial opinion, or formal written opinion of a State attorney general that is required to preserve a state’s sovereign authority or right over a Member that is a State agency. (d) Records/Audit. Each Party to this Agreement will maintain all information related to its performance under this Agreement in a current, detailed, organized and comprehensive manner and in accordance with customary industry practice and applicable Law. Each Party will maintain such records in readily accessible form, for a period of at least six (6) years from the applicable service date, or to the extent required by applicable Law, whichever is longer. Upon Afaxys GPO Services giving Member reasonable notice, Member shall provide Afaxys GPO Services reasonable access to such records to audit Member’s compliance under this Agreement or to assist Afaxys GPO Services’ efforts to audit Suppliers. (e) Exclusions. Each Party hereby represents and warrants to the other that (i) it is not currently excluded, debarred, or otherwise ineligible to participate in any federal health care program as defined in 42 U.S.C. § 1320a 7b(f) (“the Federal Healthcare Programs”); (ii) has not been convicted of a criminal offense related to the provision of health care items or services and not yet been excluded, debarred, or otherwise declared ineligible to participate in the Federal Healthcare Programs, and (iii) is not under investigation or otherwise aware of any circumstances which may result in the Party being excluded from participation in the Federal Healthcare Programs. This shall be an ongoing representation and warranty during the term of this Agreement, and each Party shall immediately notify the other of any change in the status of the representations and warranties set forth in this Section (the “Exclusion Notice”). Any breach of this Section by a Party shall give the other Party the immediate right to terminate this Agreement. (a) Contract Participation. Active Supplier Contracts will be listed on the Afaxys GPO Services’ website, which will be updated by Afaxys GPO Services from time to time. Afaxys GPO Services will facilitate processes for Member to notify Suppliers of decisions to participate in and purchase under Supplier Contracts. Afaxys GPO Services shall provide Member with a copy of all Supplier Contracts available for Member’s participation upon written request by Member. Each Supplier will determine Member’s eligibility to purchase under a Supplier Contract, and Member will purchase products and services directly from the applicable Supplier or the designated distributor under each Supplier Contract in which Member elects to participate. Member will be solely responsible for product payments and compliance with all other obligations in Member’s capacity as the purchaser under each such Supplier Contract. Accordingly, Member hereby releases and holds harmless Afaxys GPO Services from any liability or claims whatsoever with respect to such actions and obligations of Member and the Suppliers. (b) Anti-Kickback Compliance. Available at https://www.tfaforms.com/440412 is a copy of 42 C.F.R. § 1001.952(h), the discount “safe harbor” regulation of the federal Anti-Kickback Statute 42 U.S.C. § 1320a-7b(b). With respect to its purchases under Supplier Contracts or Supplier rebates it receives from Afaxys GPO Services or directly from Suppliers, Member agrees to comply with the terms of § 1001.952(h)(1), as it may be amended form time to time, and acknowledges notice of this regulation’s reporting and information provision obligations. (i)	Access to Supplier Contracts is limited solely to Members, and Member will use all products purchased under all Supplier Contracts in which Member participates solely for Member’s own patients who meet all eligibility requirements under the Supplier Contract and all applicable Law. Member will not divert, deliver, transfer, distribute or sell any 340B Product purchased under any Supplier Contract to any wholesaler, distributer, or other person or entity without specific, written permission from Afaxys GPO Services and the applicable Supplier. (ii)	In the event Member fails to comply with the provisions of this Section, Member shall be liable for all losses or costs incurred by Afaxys GPO Services, the applicable Supplier, and any other applicable manufacturers and distributers, as a result of such failure, including but not limited to, the costs of lost sales or payments that the applicable Supplier and/or other manufacturer and distributor may need to pay to their respective partners on account of such failure. In addition, Afaxys GPO Services may require repayment by Member of any and all payments or benefits provided herein. (d) Member Representations. Throughout the term of this Agreement Member agrees: (i) to comply with all terms and conditions of this Agreement, (ii) to comply with all Afaxys GPO Services’ standard operating procedures and policies established and in effect from time to time and either provided to Member or posted on the Afaxys GPO Services website, (iii) to comply with all terms and conditions of the Supplier Contracts (and any local supplements or other contracts between Member and Supplier or third parties relating to the Supplier Contracts), that are consistent with Member’s obligations under applicable law, including without limitation, payment terms, eligibility requirements, own use requirements, liability provisions, and arbitration of dispute requirements, (iv) to remain duly licensed under applicable state law to engage in Member’s business, and certified to participate in the Medicare and Medicaid programs; (v) to comply with all Laws applicable to its performance under this Agreement; and (vi) to execute separate agreements or acknowledgements as requested by Afaxys GPO Services or any particular Supplier evidencing Member’s agreement to comply with the terms of the relevant Supplier Contracts. (e) Designated Representative. Member shall appoint a designated representative, (the “Representative”), with whom Afaxys GPO Services’ employees or agents may confer regarding matters of operations pursuant to the Agreement and who will be responsible for responding to requests from, and providing information to, Afaxys GPO Services, and maintaining a current roster of Member contacts in the Customer Relationship Manager software system, or a similar system, on the Afaxys GPO Services website. The Representative will also provide Afaxys GPO Services with accurate and current data on all of Member’s sites to which Member expects delivery of products purchased under Supplier Contracts, and the Representative will provide Afaxys GPO Services with updated data in advance of any change to such data. Data provided shall include the title of the person responsible at the Member for the ordering of products and services under a Supplier Contract, main address, main telephone number of the location of the person responsible, basis for eligibility for 340B Products, and any additional information reasonably requested. No product will be shipped to any “Ship To” address that has not been prior-identified by the Representative. The contact information of the Representative shall be as set forth below, which shall be updated by Member upon written notice to Afaxys GPO Services. (a) Administrative Fees. Afaxys GPO Services is a “group purchasing organization” that is structured to comply with the requirements of the “safe harbor” regulations regarding payments to group purchasing organizations set forth in 42 C.F.R. § 1001.952(j). Afaxys GPO Services shall have the right to receive an administrative fee formulated in the manner set forth in this Section below. (i) Afaxys GPO Services may receive from a Supplier of medical products or services, a fee equal to three percent (3%) or less; and for non-medical products or services, a fee equal to ten percent (10%) or less. (ii) Afaxys GPO Services will disclose to Member in writing at least annually, and to the Secretary of the United States Department of Health and Human Services upon his or her request, the amount it received from each Supplier with respect to purchases made by or on behalf of Member. (c) Other Fees Paid By Suppliers. At its option, Afaxys GPO Services may charge a Supplier fees in addition to the administrative fees described in this Section of this Agreement, for marketing or other services rendered by Afaxys GPO Services that are separate and distinct from group purchasing services hereunder. (a)	Member grants to Afaxys GPO Services, and its affiliates and their respective employees, agents and subcontractors, a nonexclusive perpetual, irrevocable, worldwide commercial license and right to use, combine and match with other data, manipulate, analyze, modify, display, include in analytical data products, license, sublicense, sell or transfer, any data gathered or provided to Afaxys GPO Services as part of Member’s participation in the Program for all lawful business purposes whatsoever, including, but not limited to, for marketing, sales, licensing and sublicensing, promotion, and analysis; provided that no data provided hereunder may be used to identify or to attempt to identify an individual or for any unlawful purpose. (b) Subject to any applicable confidentiality agreement, Member hereby authorizes Afaxys GPO Services to have access to Member's purchasing transaction data, whether through or from Suppliers, distributors, group purchasing organizations or any business-to-business e-commerce companies through which orders for Supplier products and services are placed by Member. Member further authorizes Afaxys GPO Services to provide such purchasing transaction data to Suppliers for the purposes of improving product and service offerings available for purchase under a Supplier Contract, provided no portion of the data contains any patient health information the disclosure of which would violate applicable Law. (c)	Afaxys GPO may request no more often than quarterly that Member provide Afaxys GPO Services with Member’s historical purchasing data for the previous six (6) months and the projected purchasing requirements for the next twelve (12) months as requested by Afaxys GPO Services. Member will use its best efforts to provide this information no later than thirty (30) days after the date of the request. Subject to any applicable confidentiality agreement, such historical purchasing transaction data will include data related to purchases of Supplier products and services both under and not under Supplier Contracts. (d)	Subject to any applicable confidentiality agreement, Member agrees to use its best efforts to provide Afaxys GPO Services pricing information and other terms offered to Member outside of Supplier Contracts by Suppliers, distributors, group purchasing organizations, or other third parties for Supplier products and services. (e) Member shall utilize best efforts to provide Afaxys GPO Services with a complete response to any reasonable survey request provided to Member by Afaxys GPO Services within thirty (30) days of a request by Afaxys GPO Services. (a) Term. The term of this Agreement will commence on the Effective Date and shall remain in effect for two (2) years thereafter (the “Initial Term”), unless terminated earlier under the terms of this Agreement. Thereafter, this Agreement will automatically renew for successive one (1) year terms (each, a “Renewal Term”). Either Party may terminate this Agreement at the end of the Initial Term and at the end of each Renewal Term upon no less than ninety (90) days prior written notice. (b) Breach. If a Party to this Agreement commits a material breach of this Agreement or a Supplier Contract, the non-breaching Party will be entitled to terminate this Agreement in accordance with the following: (i) the non-breaching Party will give the breaching Party written notice of such breach; (ii) the breaching Party will have thirty (30) days from the receipt of such notice to cure such breach; and (iii) in the event the breaching Party fails to cure such breach, the non-breaching Party will be entitled to terminate the Agreement as of the end of such thirty (30) day period. Provided, however, if the non-breaching Party determines in its reasonable discretion that the breach is not curable, then the non-breaching Party may terminate the Agreement any time after giving written notice. Afaxys GPO Services may also terminate this Agreement immediately with written notice to Member in the event that Afaxys GPO Services determines, in its sole discretion, that a) Member does not meet the minimum requirements for membership in the group purchasing organization; b) is in breach of this Agreement with respect to Diversion/Own Use; or c) if continuation of this Agreement may be detrimental to the operations of Afaxys GPO Services or the other Members. (a) WARRANTY. AFAXYS GPO SERVICES MAKES NO GUARANTEES AS TO MEMBER’S EXPERIENCE OR SATISFACTION WITH ANY SUPPLIER AND MAKES NO REPRESENTATIONS OR WARRANTIES IN CONNECTION WITH THE GOODS OR SERVICES TO BE PROVIDED BY A SUPPLIER HEREUNDER, WHETHER EXPRESS OR IMPLIED, AND INCLUDING BUT NOT LIMITED TO ANY IMPLIED WARRANTIES OF MERCHANTABILITY, FITNESS FOR A PARTICULAR PURPOSE, INFRINGEMENT AGAINST ANY THIRD PARTY PATENT OR OTHER PROPRIETARY RIGHTS OF A THIRD PARTY, AND ANY WARRANTY ARISING OUT OF PRIOR COURSE OF DEALING OR USAGE OF TRADE. WHILE AFAXYS GPO SERVICES USES REASONABLE EFFORTS TO ENSURE THAT THE PRICING, PRODUCT INFORMATION AND OTHER INFORMATION AVAIALBLE TO MEMBER THROUGH ITS TECHNOLOGY APPLICATIONS IS CURRENT AND ACCURATE, AFAXYS GPO SERVICES CAN NOT GUARANTEE THE ACCURACY OR COMPLETENESS OF IT. (b) LIMITATION OF LIABILITY. IN NO EVENT SHALL AFAXYS GPO SERVICES BE LIABLE FOR ANY INDIRECT, SPECIAL, INCIDENTAL, PUNITIVE, INDIRECT OR CONSEQUENTIAL DAMAGES, INCLUDING, WITHOUT LIMITATION, LOSS OF PROFITS, REGARDLESS OF THE FORM OF ACTION, ARISING OUT OF OR IN CONNECTION WITH THIS AGREEMENT, WHETHER DUE TO BREACH OF CONTRACT, BREACH OF WARRANTY, TORT, NEGLIGENCE OR OTHERWISE. THE ENTIRE LIABILITY OF AFAXYS GPO SERVICES FOR ANY ACTION, CLAIM OR CAUSE OF ACTION WHATSOEVER, INCLUDING WITHOUT LIMITATION, BREACH OF CONTRACT, WARRANTY, TORT, NEGLIGENCE OR ANY OTHER LEGAL THEORY, SHALL NOT EXCEED THE ADMININSTRATIVE FEES RECEIVED BY AFAXYS GPO SERVICES FROM SUPPLIERS THAT RESULTED FROM MEMBER’S PURCHASES UNDER SUPPLIER CONTRACTS DURING THE TWELVE (12) MONTH PERIOD IMMEDIATELY PRECEEDING THE DEFAULT. (a) Dispute Resolution. Except for matters subject to emergent or injunctive relief, in the event that any dispute relating to this Agreement arises between the Parties, either Party may by written notice call an in-person or telephone meeting regarding such dispute, to be attended by at least two (2) senior executives of each Party with authority to bind the Party to a resolution who shall attempt in good faith to resolve the dispute. If the dispute cannot be resolved through such negotiations within thirty (30) business days after the date of the initial notice, each Party shall retain all rights to bring an action regarding such matter in accordance with Laws. Member shall comply with the terms and conditions governing dispute resolution in the Supplier Contracts, and shall make good faith efforts to notify and consult with Afaxys GPO Services prior to initiating any legal action or other formal dispute with a Supplier. Any Party may change the address to which notices are to be sent by notice given in accordance with the provisions of this Section. Notices hereunder shall be deemed to have been given and shall be effective upon actual receipt by the other Party. (c) Relationship of the Parties. This Agreement does not create any franchise, joint venture, partnership or other similar legal relationship between Afaxys GPO Services and Member. No Party has the authority to bind or act on behalf of the other Party except as otherwise specifically stated herein. There are no third party beneficiaries of or to this Agreement. (d) Assignment. Neither Party hereto may assign this Agreement or assign, transfer, or delegate rights or obligations under this Agreement, without the other Party’s prior written consent, provided, however, that Afaxys GPO Services may freely assign this Agreement to any affiliate, subsidiary, parent or commonly-controlled entity of Afaxys without the consent of Member. (e) Force Majeure. The obligations of the Parties to perform under this Agreement will be excused during each period of delay caused by acts of God, by shortage of power or materials, by government orders or by other events that are beyond the reasonable control of the Party obligated to perform. (f) Counterparts and Electronic Signature. This Agreement may be executed in two or more counterparts, each of which shall be deemed an original, and all of which together shall constitute one and the same agreement. Any signature transmitted by facsimile, e-mail, or other electronic means shall be deemed to be an original signature. (g) Entire Agreement. Upon the Effective Date of this Agreement as set forth above, any previous membership agreement with respect to the subject matter hereof entered into by the Parties is hereby deemed null and void. This Agreement, including the exhibits and attachments hereto, constitute the entire understanding and agreement between Member and Afaxys GPO Services concerning the subject matter hereof, and supersede all prior negotiations, agreements and understanding among the Parties, whether oral or in writing, concerning the subject matter hereof. (h)	Amendment and Waiver. This Agreement may be amended, supplemented or otherwise modified only by means of a written instrument signed by authorized representatives of both parties. Any waiver of any rights or failure to act in a specific instance shall relate only to such instance and shall not be construed as an agreement to waive any rights or fail to act in any other instance, whether or not similar. (i)	Governing Law. This Agreement shall in all respects, including validity, interpretation and effect, be governed by and construed in accordance with the laws of Delaware. The parties each irrevocably consent and submit to the personal jurisdiction of the State and Federal Courts of Delaware. (j) Survival. The terms set forth in Sections 2, 3(b), 4(b) and 7 shall survive the expiration or other termination of this Agreement, regardless of the cause giving rise to the expiration or termination.